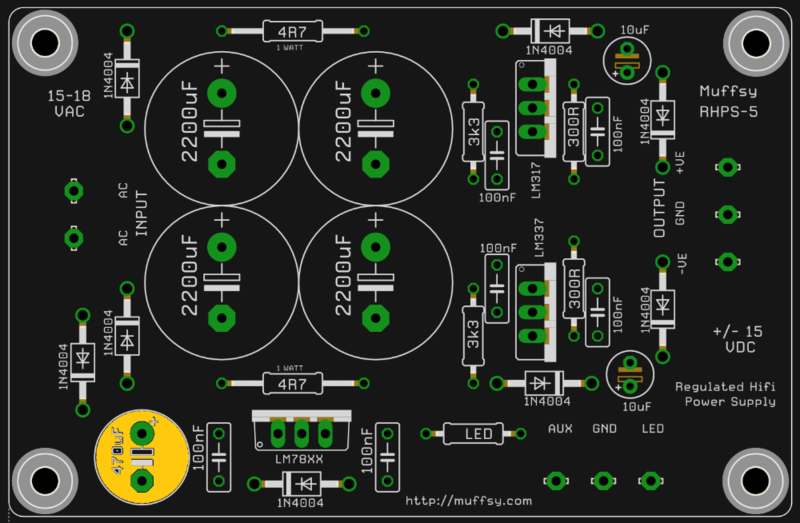 Here are the build instructions for the Muffsy Hifi Dual Power Supply v3. 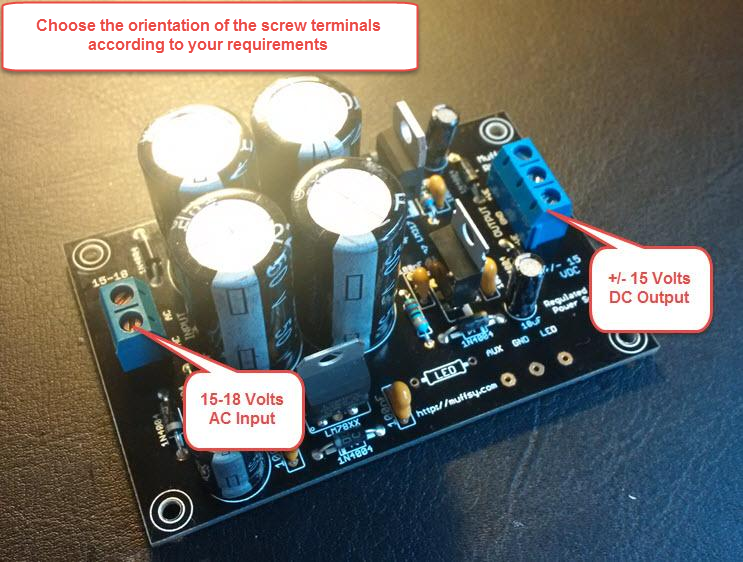 A 15-18 volts AC wall adapter (do not exceed 18 volts) is needed to make this power supply work. Here is some more information about what you need to build the Muffsy Phono Preamp and Power supply. 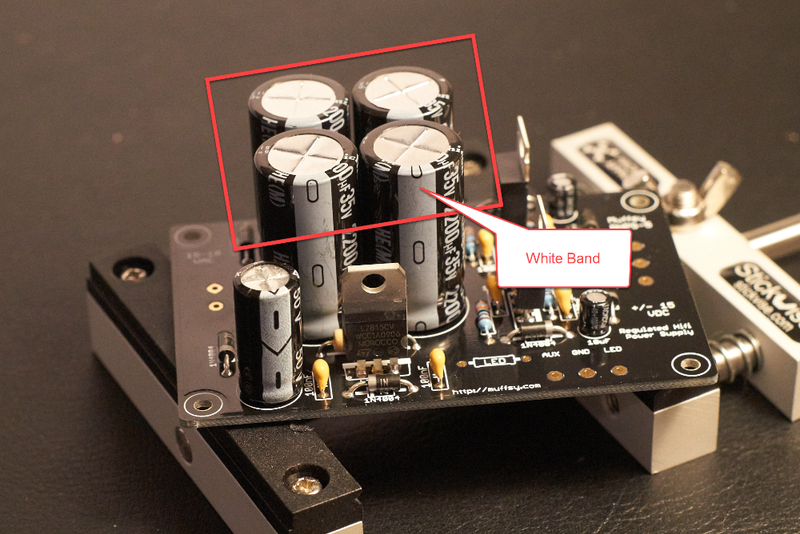 These are the components needed to build the power supply. There are eight 1N4004 diodes on the board. Take your time and make sure you have them oriented correctly. The silver band on each diode matches the symbol on the printed circuit board. Before you continue, consider if you want to change the output voltage. The Muffsy kits are made for +/-15V (which is what you get if you use the included components), but you may have other plans for the power supply. 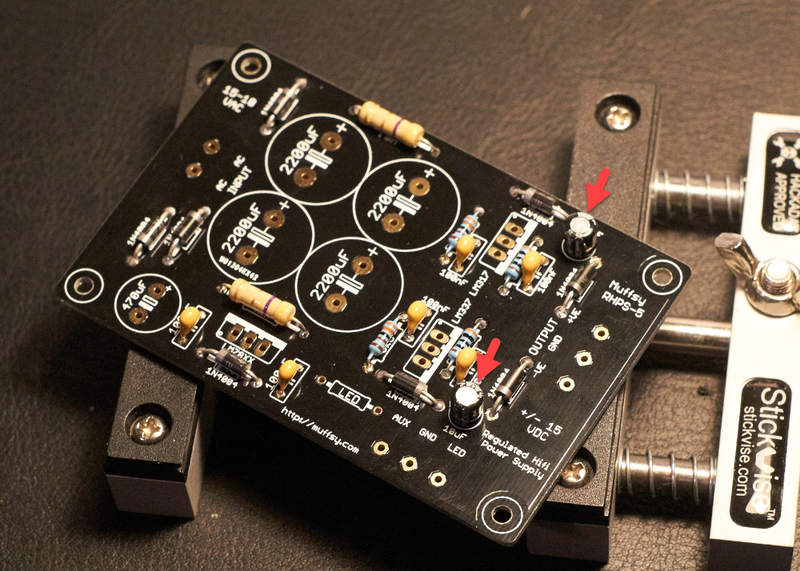 If you plan to use other operational amplifiers, check what their maximum voltage is. Some may need less voltage. 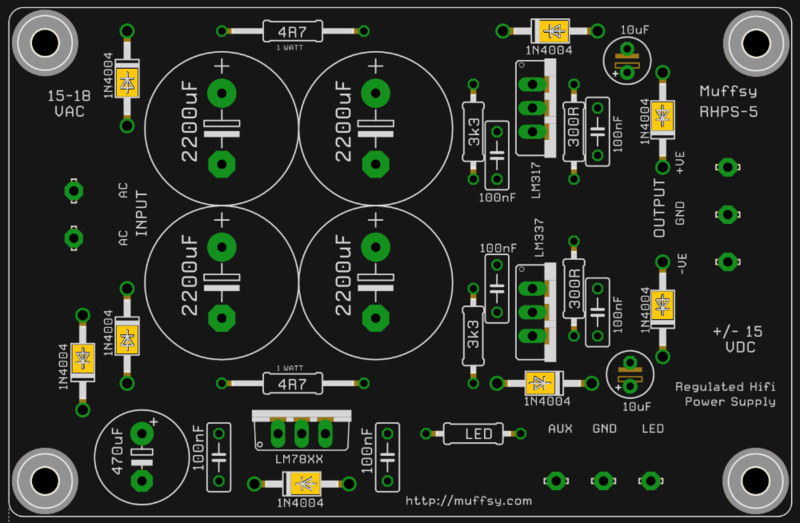 There are four of the 0.25W resistors, they can be oriented whichever way you want. It is a good idea to measure them before they are soldered in place. The two 1W resistors can be mounted either way. 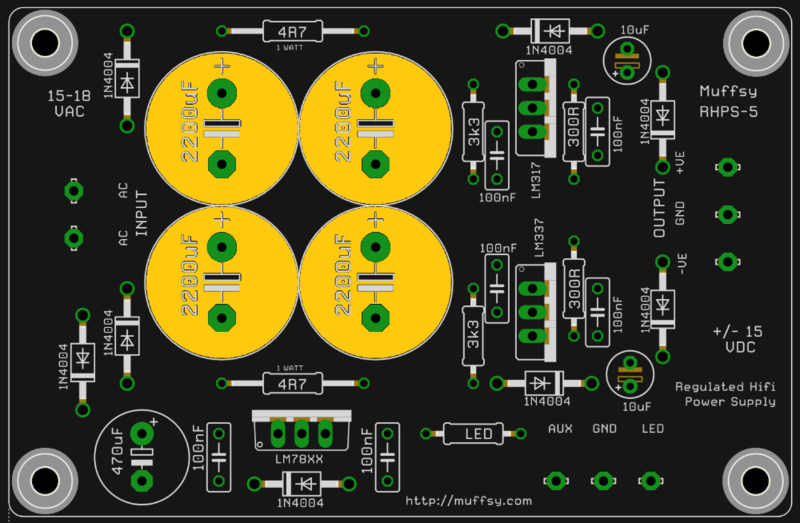 Next you've got six ceramic capacitors to place on the board. The orientation does not matter for these, but I like to place them so that the text is outwards and visible. These two capacitors must be mounted the right way around. 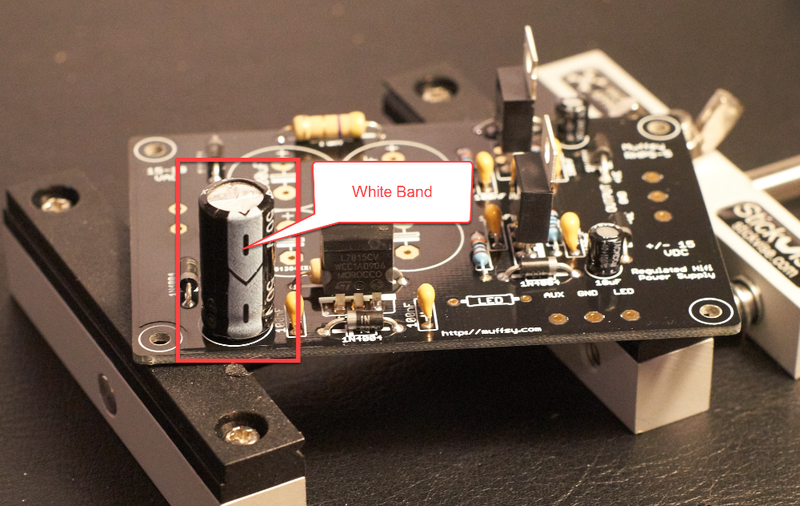 The white band (the negative side of the capacitors) are pointed upwards on the board. See the pictures below for reference. 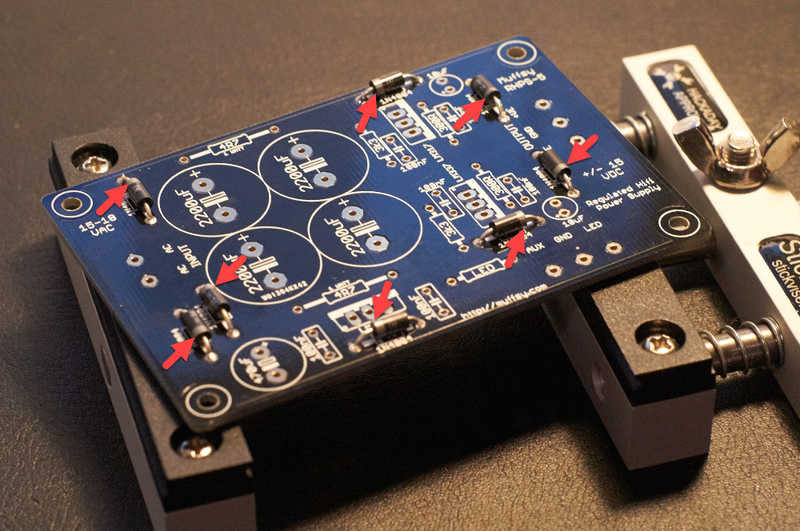 The board has three voltage regulators. One for +15V, one for -15V and a third one for +15V AUX power. 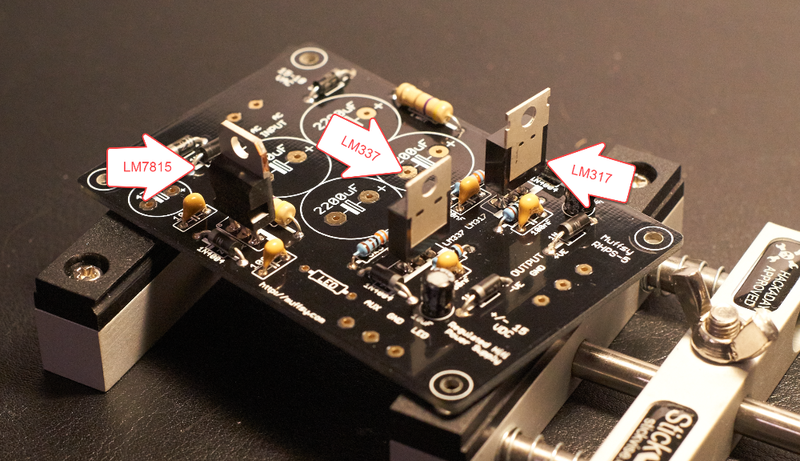 They are three different models, make sure you identify them as LM317, LM337 and LM7815. It's important to get both the placement and the orientation of the voltage regulators correct, so there's two pictures from different angles. Voltage regulators. 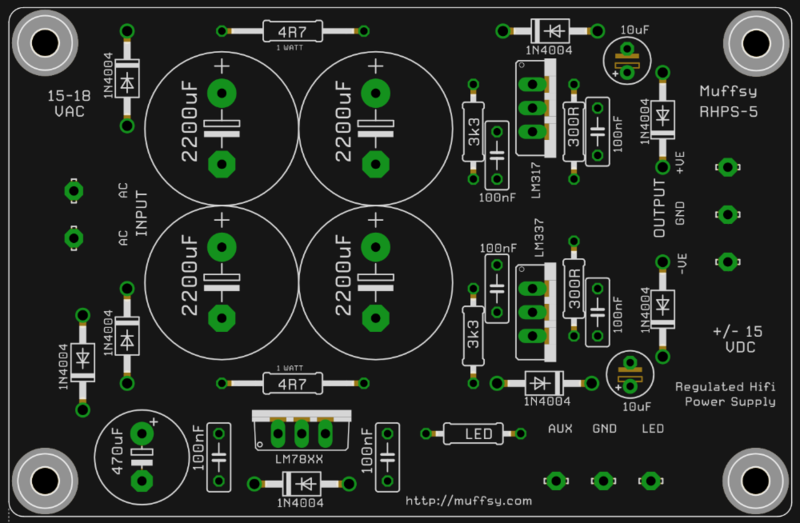 Notice that the metal plates line up with the bold white lines in the component outline on the PCB. 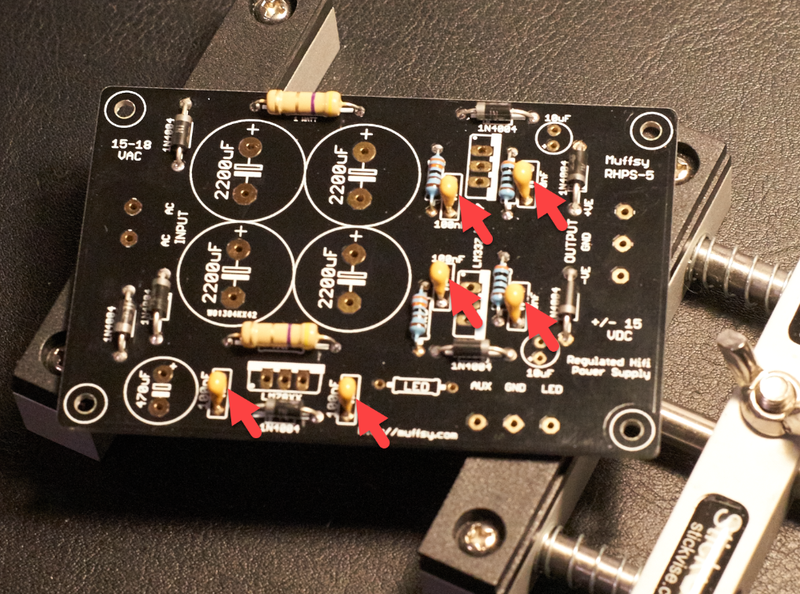 The orientation of this capacitor is important, place it as on the pictures below and solder it in place. There are four large 2200 uF electrolytic capacitors on the board, for smoothing the rectified AC voltage. Orientation is important, all the white bands are facing downwards. Double check the orientation before you solder these capacitors in place, they can be pretty hard to desolder. 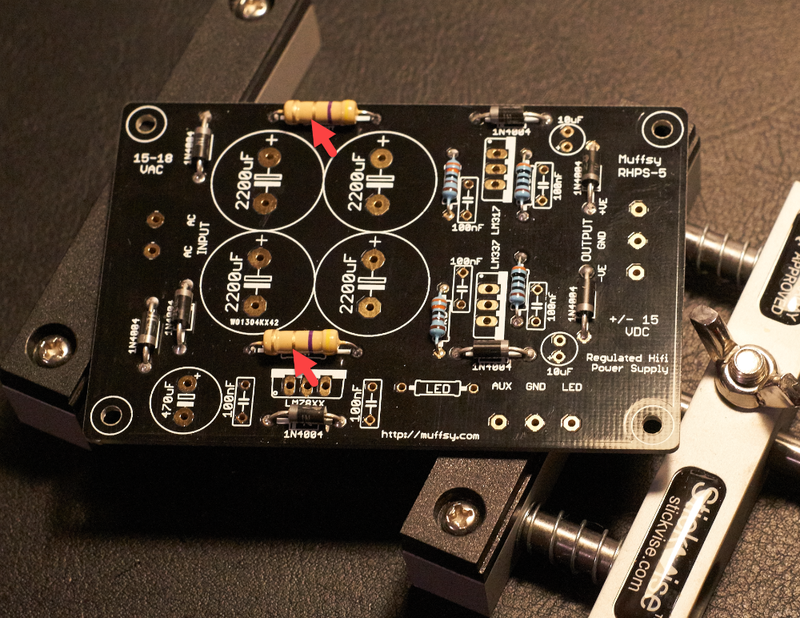 If you are building your Muffsy Phono Preamp or MC Head amp into a B0905 enclosure, please don't solder the screw terminals just yet. 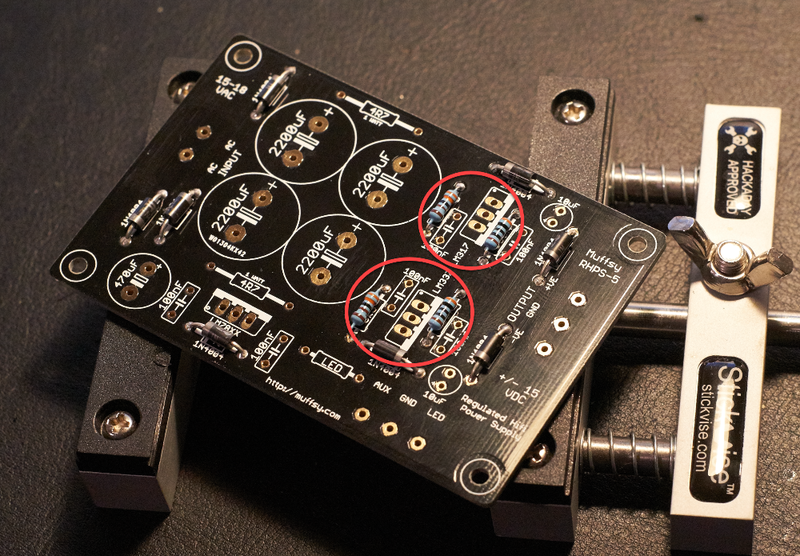 If you are using a custom enclosure for your build, the screw terminals may be soldered in place now. You still might want to consider fitting the cables before soldering the terminals to the PCB. Tinning the cable ends might also make it easier to insert them into the screw terminals. The screw terminal with two connections is for the 15-18V AC input, from the wall adapter. 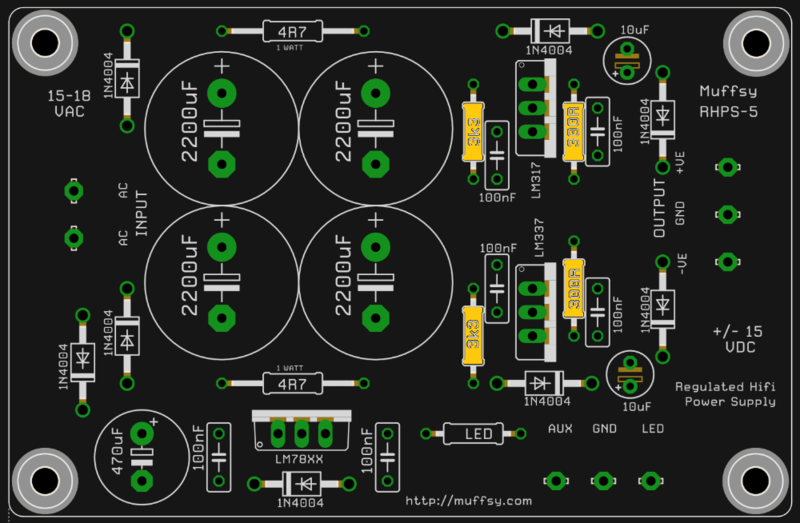 The screw terminal with three holes is for the +/- 15V DC output and ground. 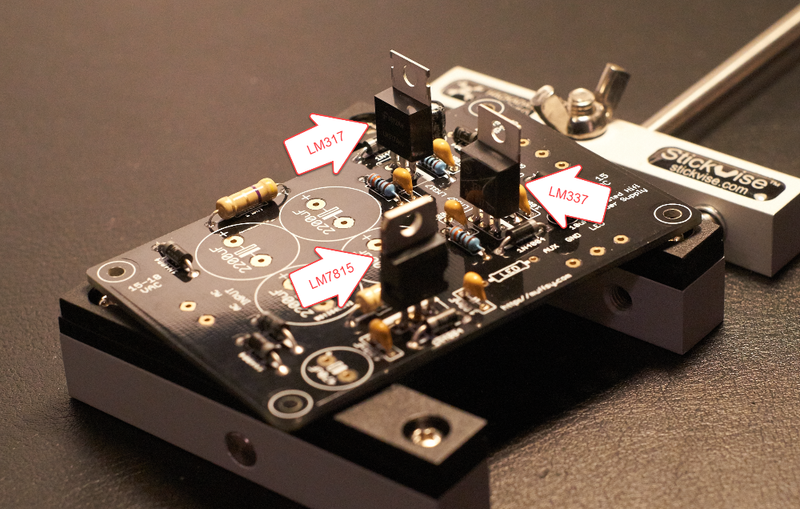 Congratulations, you have built a power supply.